Why do we run these t-shirt slogan contests? Is it because we are terrible people who like to frustrate our fellow PPC-ers with tantalizing prizes and exorbitant delays? We do it because we want our customers, fans, friends and employees to participate in the creation and reformation of our brand. This year Acquisio has gone through a complete redesign. We wanted to figure out who we are, why we’re different, and why the heck you should care. We spent months updating our site, adding new features, and of course continuing the transition towards the second, even better, version of Acquisio. Funny enough for a PPC software company, our t-shirts are a big part of who we are. 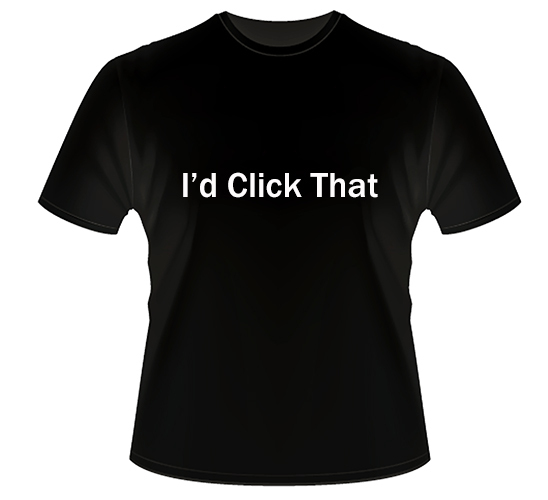 The t-shirts started out as a way to connect all PPC professionals – our apt slogan just got the frustrations and excitements of the SEM world and it was our way of saying, hey – we get you, and our platform gets you too. We know the heartaches, the ups the downs and the big wins in PPC, and our t-shirts reflect all that and more (since we have dozens of t-shirt slogans at this point). Above all, our t-shirt slogans got people excited and our small idea to bond with our clients and fellow marketers took on a life of its own. Not only did people want to wear them – they wanted to make them. And we loved that idea. This year’s Acquisio t-shirt slogan contest was not the first, but it was definitely the best. By a mile. By ten miles, actually! First off, we received more than 750 t-shirt slogan entries. Wow! At one point we even thought about stopping the contest early because we had such a flood of entries, but we’re glad we didn’t. After MUCH deliberation, we narrowed it down to the top five. Then, when it came time to vote, we received 1245 unique votes over the span of little more than a week. Hell yeah! 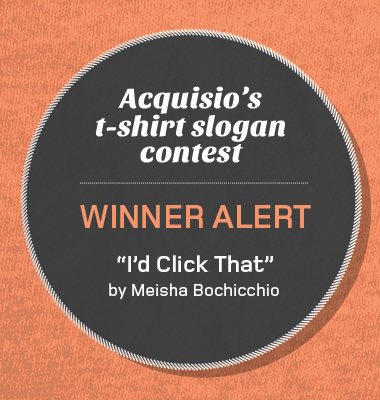 I’d Click That – submitted by Meisha Bochicchio from Fuel Interactive with a whopping 439 votes! She wins a $500 pre-paid Visa and up to 25 t-shirt with her awesome slogan on it, to share with her officemates or to hoard for herself, whichever she prefers. Plus, we had a side contest going on for all Acquisio employees, since we love the contest so much we can’t resist entering ourselves. Damn, I Make Data Look Good by Stephen Capper, a technical support agent. Stephen gets a $250 prize and the respect of all his (jealous) Acquisio employees. To see all the finalist and how many votes they got, check out the T-shirt Contest page here. Until next t-shirt contest PPC lovers!